Devbhmi Public School was established in 2002, on the bank of river Alknanda in Nakot, Bilkedar, to provide quality education to the learners in a serene and quite environment. 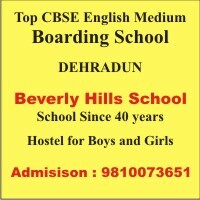 School is situated about 1 km far from the Rishikesh – Badrinath highway at Nakot. The objective of the school is to produce learners with the motto ‘Learning Begets Modesty’. The aim of the school is to develop the aspirants as qualified teachers for teaching at elementary, primary and secondary levels soon school will start higher secondary. There is Green Palace Hostel near the school for far of learners. School offers active learning to all the students regardless any discrimination of class, creed and gender. Curriculum of the school is designed to suit the need of the young generation. School is well equipped with the latest technologies so that our students can have pleasurable learning. It is based on computer based cooperative education which is not only career oriented but also enable learners to attain success in all facets of life.